Many years ago, possibly in the late seventeen hundreds, a young orphan girl, Mary (or Kitty) Jay was employed at a farm close to Manaton in Devon. She had lived there from about the age of five and, although befriended by the farmer's son Jamie, it is believed that she led a solitary existence. Her living conditions are reported to have been primitive, her work long and arduous and her life in general miserable, all of these facts being compounded by having no one to turn to in times of sorrow. Whilst still in her teens, possibly only 17 or 19, she became pregnant, reportedly after being raped by a youth whom she had fallen in love with during a summer hiring on the farm. As so often happened in those days poor Mary was left to carry the blame whilst the man appears to have escaped scot-free. So great was her shame that she repaired to a barn on the farm where she committed suicide by hanging herself. Such was the stigma attached to this form of death that the three local parishes refused to have her buried within their boundaries. Eventually, as a compromise, she was buried at an unconsecrated spot at a point where the three parishes joined...as it were in neutral territory. In 1860, in order to investigate the site and confirm the various stories surrounding it, the area was dug over by a team of local worthies led by a Mr. Bryant. Human remains were found which were subsequently identified as those of a young girl. These were placed in a wooden coffin and reburied at the site, but this time the grave was marked with a rectangle of granite stones, which still stand to this day. 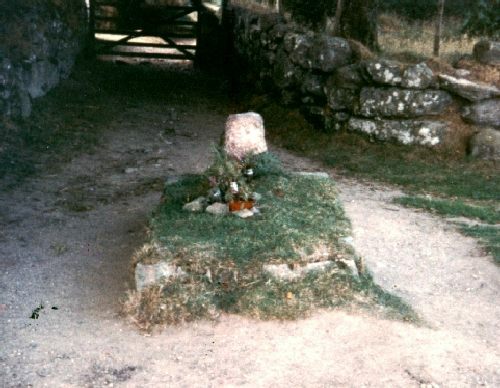 The grave still receives regular posies of yellow flowers, the same colour which legend relates that Mary and Jamie used to pick together in childhood. The placing of these flowers has itself spawned it's own legends being attributed to local children, passing gypsies, pixies, or as the locals maintain, either the spirit of Jamie comforting his forlorn sweetheart, or her murderer seeking atonement. Spectral figures caught unaware by the headlights of nocturnal travellers have been known to disappear without trace in full view. Author Celia Ann Leaman has written a book based on the story.